Orcs Must Die! is a humorous, interesting franchise. Robot Entertainment is great about listening to what their fans want, and it shows in each game. 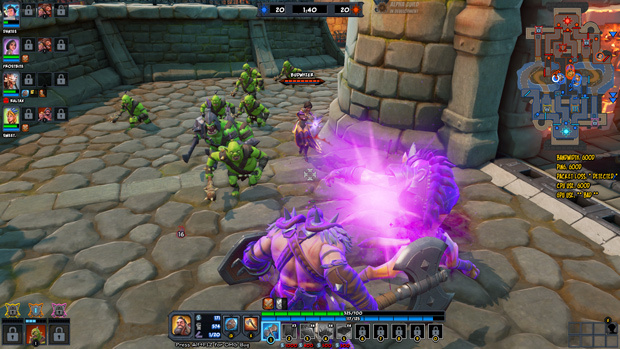 The series of strategy games began with Orcs Must Die!, a third person action strategy game. 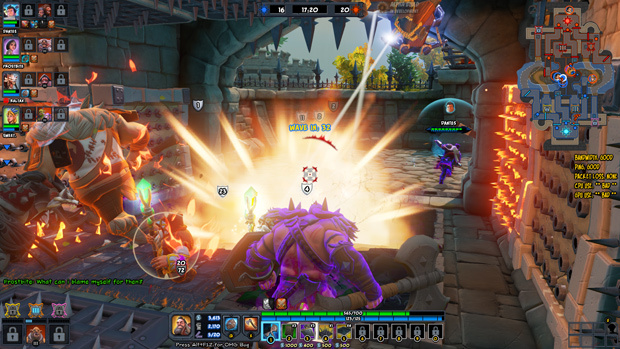 The player defends magical entities called Rifts, using a variety of traps and tricks to stop wave after wave of Orcs, and other vile creatures. 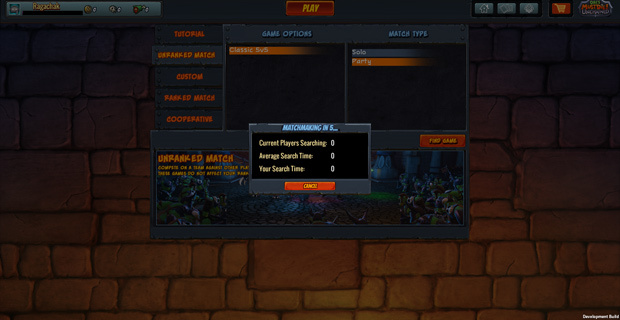 The fans called out for multiplayer after the success of the first game. 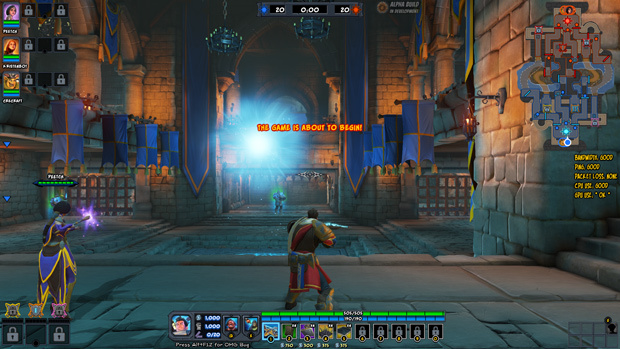 The sequel gave multiplayer, with two players defending their keep against waves of evil. 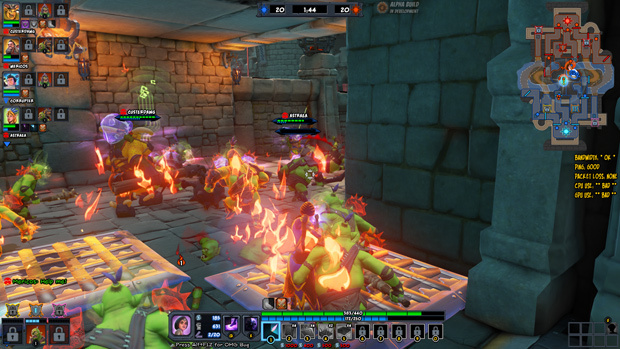 Now, in Orcs Must Die! Unchained, the call for versus has been heard! 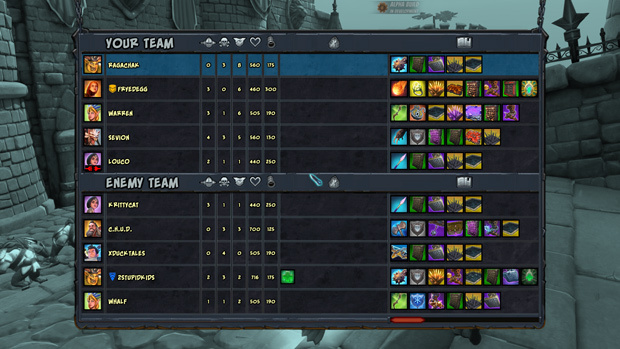 In this two teams (4 vs. 4 or 5 vs. 5) do battle, defending their keep while simultaneously attacking the enemy. They hire minions using cards that they win by winning games, or purchased outside of game. Each player has a deck of cards, which they can customize in whatever way they see fit, out of cards they own. As you level, you can have multiple decks, fitting whatever situation you might be in. Each player chooses a hero, and you can get them in a variety of ways. There are the ones that are free to play for that week; packs of cards might unlock them also (I unlocked Ball and Chain this way!). Of course, there’s also purchasing them with in-game currency or with gold (which is used via real money). Each game starts with each side having 20 points. Each time a minion makes it to the main base of the enemy side, past their gates and guardians, a point is lost. The first to bring the other team to zero wins. That sounds simple enough, but there is far more to it than that. Picking the right minions for your deck, the right heroes to complement them, and the strategy to stop the other side is imperative. Simply going in with whatever feels good or looks cool may not be the best idea. Communication and teamwork are paramount in this title, and the way the game is played ought to promote this ideal. The minions that are fighting are a part of a faction called “The Unchained.” It is a host of orcs, gnolls, humans, and worse that all fight together for the pure purpose of destruction. 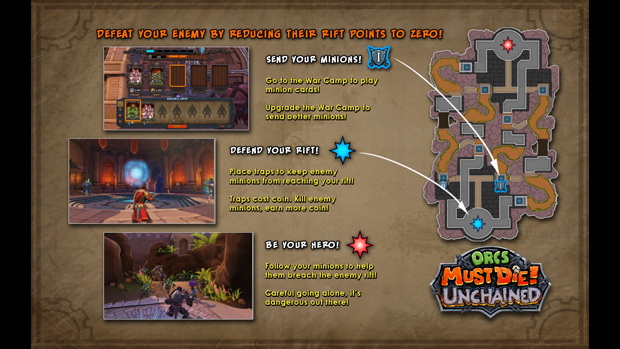 The plot of Orcs Must Die! 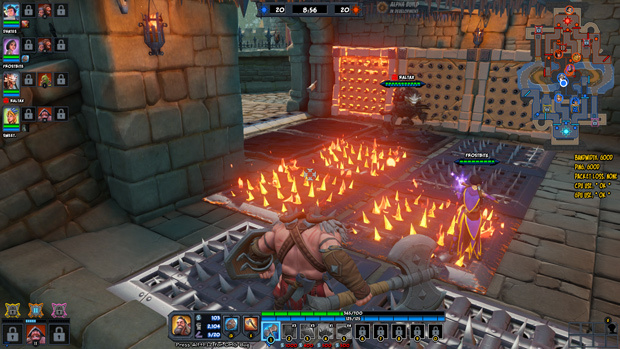 Unchained feels a little thin, but it is a free-to-play multiplayer fortress siege, so I guess that is well enough. It feels a little different from your average MOBA, in that there is not going to be just one popular meta. Each team should, and likely will, come up with their own strategy and own way to win the game. The name of the game is strategy. One does not simply zerg one lane over and over in Orcs Must Die! Unchained. At least, not if they want to win. 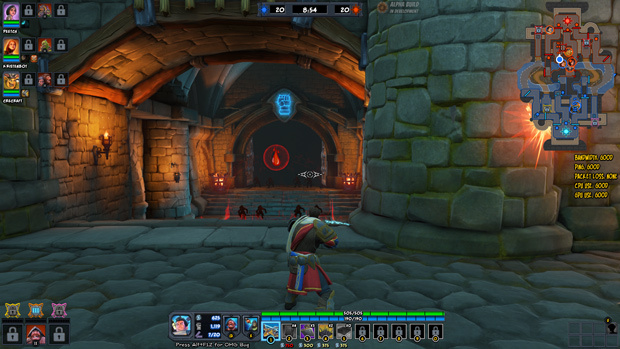 Like most MOBA-style games, Unchained’s maps have three lanes; only one starts unlocked however. I do not know how the other maps will be, as of yet I have only played one castle vs. castle map. From this one choke point, your team can each place a minion card for a cost of points and every so often, at a set interval, a new wave will spawn from this point. Each minion has its own strengths, weaknesses, and abilities. Some rush straight for the enemy rift, some like to focus and kill. Each minion card has its own unique set of entities that come with it. 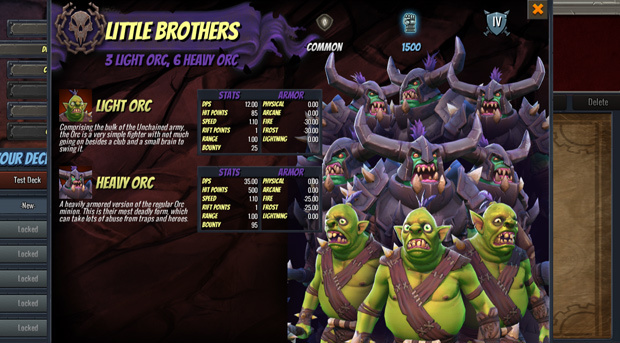 Whether it is two massive Ogres, or a squad of eight Orcs, your waves will vary depending on what your team is using. It is also important to note that some of the heroes have benefits depending on what minions are on the field. An example being Ball and Chain is a large Ogress with a ball and chain. Her passive (constantly available) ability reads that if she is in combat and there are orcs available around her, they, in their infinite love of Ball and Chain, will take some of the damage for her. So it would stand to reason that a squad running her would have lots and lots of Orcs on the field at all times. Several games I have been in someone has asked us to all run Orc decks so they could take advantage of a nearly-unkillable Ball and Chain. It is sound reasoning and teamwork. The choke points go up to level four, and it requires your team to spend points on it to level it up, or to unlock another point. Now sure, you could only level the Orange (the other two are purple/pink and yellow) point, get it to level four and push as hard as you can down the middle lane. However, your opponents are no doubt going to see this, and level their outer points so they can keep a few people defending the mid with powerful traps and a tight defense, and decimate your other two lanes. You cannot be everywhere at once, and the name of the game is action-reaction. For every action you take, the other team can react and possibly outdo your own team. So it is imperative to be aware of what is going on, and being capable of reacting, even if it means selling your traps and moving them to other lanes. Traps: You can lay them in a variety of areas and ways, and they have a coin cost. You have only so many traps, and a limit of traps that can be placed per side. So if the limit is 20, your team can only have 20 total traps. If your deck has your Magma trap, and you have 6 copies of it, it only takes up one slot in your deck, and you can use it six times at once; if you can afford it, that is. There are far too many traps to list, and over time you will find some that are invaluable to you, while others are more situational. Minions: Minions have a level, one through four. Each minion card has a point cost, a level, and stats. You can initially only have one of each level in your deck, but the higher your player profile level, the more you can add. Some cards bring one or two minions to the field (Dumber and Dumbest = Two Ogres), or seven (Boom Goes the Dynamite = 3 heavy soldiers, 4 dwarf grenadiers)! Gear: Gear consists of wards, equipment, or other items that can enhance how you play. They may or may not have a mana cost, which you activate on your skill bar (for me so far, they have been at the “1” key), such as the lightning ward, which gives a lightning resistance aura to players and minions nearby. Depending on what the opponent uses, this could be invaluable in dealing with traps and abilities of other players. 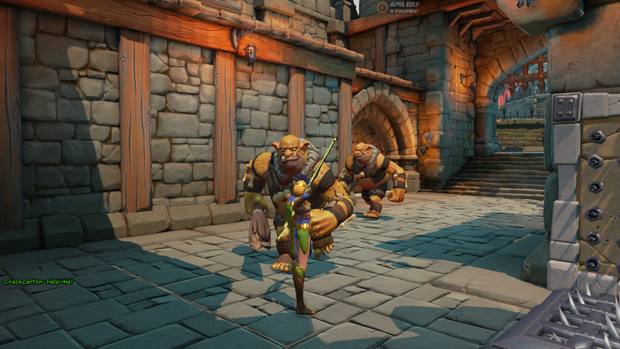 Glyphs: Glyphs are placed on the ground, generally right in the path of where minions will tread. Minions who cross these gain a variety of buffs or boosts, such as attack damage or total health, but cannot be added to your deck until you hit level seven and a second glyph at level eighteen. Weaver: Weavers are very powerful, and can buff you and your party in a variety of interesting and useful ways. You do not get the ability to have a weaver in your deck until level eight, and two more slots as you go on. They add a host of abilities: Elspeth is a lightning weaver, and she gives powers such as granting your Rift a lightning attack every ten seconds, increasing lightning resistance and giving lightning elemental damage more power. She’s also classified as Arcane and wears lightning armor. The other important power she has is “Trickle Coin,” giving you a slow, but constant influx of coins. Weavers should be employed when possible, and if your team is using a variety of them, a great deal of power can be bestowed upon your squad. This game has such a wide variety of traps that I could probably write an entire article focused only on them. From laserbeams, to collapsible plates on the ceilings, to magma traps, spike traps, electric spike traps, or even arcane spikes, the ways you can dismember and disintegrate your foes are endless. You can shoot projectiles from the walls, or lay viscous pits of tar that slow enemies. You can do so much with your deck that even in a Moba setting, the individuality of each player on the field can be felt. Synergy is not hard to create in Unchained, and I invite players to experiment and find what suits them, and what suits their teams. There are no social options yet, but I assume you will be able to have friend lists and quite possibly teams, what with the “Rank-ed” Matches that will be available. Tutorial: This will show you how to play the game. Thank goodness for it, because I was incredibly new to the franchise before this beta! You play as the Sorceress, and will get the ins and outs of the game. Unrank-ed Match: Right now we just have the classic 5-on-5 match, where you can enter as a solo member or as a party. However, the party system does not appear to work just yet. The map is not picked, and I imagine it will be random, as more maps are added. Custom: You can make a casual match just for you and your friends, or to prove your skill against other players without the randomness of other people! In this you can add people, pick your map, et cetera. One could also use this to practice placement of traps and minions to see how they synergize together. Ranked: Ranked is currently not available, though I suspect it will be solo queue or with a partner, similar to League of Legends. If I wind up with more information on this, I will certainly edit it in! Cooperative: This is the players vs. enemy bots mode, where you can practice with people, or simply just play for fun against bots to see how you fare. I tried this on several occasions; I do not suppose many people are playing it right now. I hope more do though! Again, there is only one map right now, much to my chagrin; I’m certain there will be more and more coming. This title feels like Team Fortress 2 meets League of Legends in a wacky, violent, trap-filled smorgasbord of violence and chaos. So much is going on at one time that it can be overwhelming, but exciting at the same time. Just because your team is down points does not mean it is over. I will grant you that it can be incredibly hard to come back, but there is nothing more satisfying than the score being 3-20, then 3-0 mere moments later with the right teamwork. The wait times are pretty lengthy right now, but that may be a result of how early the beta is. The game is still growing and should resolve this major issue soon. Despite this being a closed beta, and seeing many of the same faces over and over, I feel this community is strong, and so are the developers. Each and every time I queue, no matter who is there, the game is always different, even if it is the same map; each squad will react a different way to varying stimuli and that is what makes this game shine. 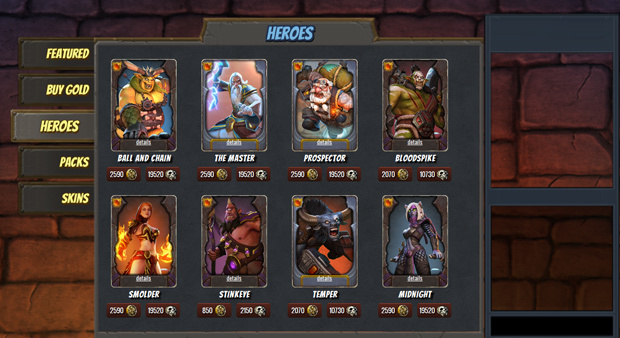 The heroes are interesting, the game modes, while straight forward, are always fun. One of the big gripes I have right now though, is if for some reason you disconnect, or your power flickers, you are out of a match. You can’t reconnect to it at this point in time. That has happened to me on a few occasions (including a game where I got paired with one of my co-workers, James Bl0nde), and I could not return to help them. It left a permanent handicap. In fact, I’ve only had one game so far where I had an entire team of five people. One went so far south as to have two on five. Other than that, the game is very enjoyable, whether spending money on it or not, I think everyone can enjoy this kind of carnage. The graphics are kind of cartoony and simple, but it fits the series; it’s not something that I feel should be taken seriously, but one can revel in the silly, almost cartoon-like violence that Unchained offers up. The characters are well designed, as are the minions. The traps when bunched up and going off all at once can feel overwhelming visually, but it is still all very appealing. The controls are tight and simple to use. I think the one thing so far that has stood out as vexing to me is closing gates. It uses the “F” key, which is fine, but on shorter characters, having to angle up at it can be annoying if you are on the go and there is an emergency. I found myself running, jumping, opening the gate, and short-hopping to close it before running off again. The movement and combat is pretty simple, with WASD and 1-7 for items/traps and Q through E for skills. I was never big on skill-shots, so that proved to be a little difficult, but that is just for me personally. I do not in any way rate something down based on my lack of skill. While there are not lots of features as far as gameplay modes go, the sheer weight of customization that can be done is staggering. You can have several decks, each with different themes, or ideas behind them so that you can really do just about anything you need or want to do in a map. That really says something to me. It’s so much different than “Runes and Masteries”, or leveling skills and buying new items. No, you prepare with everything you’ll need before the game, and that speaks to me. The sounds and music are pretty fantastic, but it feels like the soundtrack got ripped straight out of Blizzards’ Warcraft 2: The Dark Portal. The music that hits when a wave starts really feels to me like its 1995 and I’m playing Warcraft again. Not that that’s a bad thing, I love nostalgia, but it doesn’t feel original to me. The sounds and special effects of the traps going off are quite lovely. I think this is all very good, but the music again does not feel inspired at all. I was a little disappointed, despite liking the sound. Ornn, the Fire Below the Mountain, is the latest champion release from League of Legends and is by far the raddest ram around.